user warning: Table 'drupalgastronomer.comments' doesn't exist query: SELECT COUNT(*) FROM comments c WHERE c.nid = 171 AND c.status = 0 in /home/dgabriner/gourmetgastronomer.com/modules/comment/comment.module on line 992.
user warning: Table 'drupalgastronomer.comments' doesn't exist query: SELECT c.cid as cid, c.pid, c.nid, c.subject, c.comment, c.format, c.timestamp, c.name, c.mail, c.homepage, u.uid, u.name AS registered_name, u.signature, u.picture, u.data, c.thread, c.status FROM comments c INNER JOIN users u ON c.uid = u.uid WHERE c.nid = 171 AND c.status = 0 ORDER BY c.thread DESC LIMIT 0, 50 in /home/dgabriner/gourmetgastronomer.com/modules/comment/comment.module on line 992. Buffalo Wings--really good. Oven Baked Buffalo Wings--even better. Oven Baked MANGO Buffalo Wings with Mango Cream Dipping Sauce? I think I could eat these every single day. So I had three ingredients in front of me--mango, brown sugar, and cardamom. You can go sweet, or sort of savory with these three things. What I came up with is a little of both. The wings are spicy, with a hint of mango, and while oven baked, still nice and crispy. The dipping sauce is perfect alongside the wings. It's cool, creamy, fresh tasting and a little sweet. I thought I could add pureed mango to the Frank's Hot Sauce that the wings get coated in. It worked really well! And even better, it really cut down on the amount of butter in the sauce! And we'll need something cool and creamy to offset the spicy wings, won't we? What if we mix pureed mango with sour cream, add some lime and a bit of brown sugar and cardamom? Yeah, that works! And it helps that it's lick-the-bowl delicious! I'm already thinking of other ways to use this sauce... I used three mangoes (the last three in the store!) for these two recipes, which was about two cups when pureed. Mango Buffalo Wings 20 chicken wings 1 cup flour 1/2 tsp garlic powder 1/2 tsp salt 1/8 tsp cardamom 1/2 cup Frank's Hot Sauce (or another hot sauce, if you prefer) 1/2 cup pureed mango 1/4 cup melted butter or canola oil Heat oven to 400°. In a large ziptop bag, combine flour and dry spices. Add the wings to the bag, seal, and toss to coat. Place the wings on a plate and chill in the fridge for about 30-35 minutes. 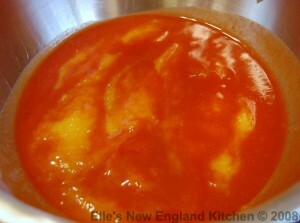 In a bowl, mix the pureed mango and hot sauce. Stir in melted butter or oil. Carefully dip each wing in the sauce, turning to coat. Place on a rimmed baking sheet, covered with foil and lightly greased. Bake for 40 minutes, carefully turning the wings halfway through cooking time. When the wings are done, remove them from the pan and put them on a cooling rack to prevent them from getting soggy. 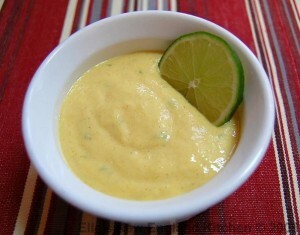 Serve with Mango Lime Cream: Mango Lime Cream Dipping Sauce Makes approx 2 cups. 1 1/2 cups pureed mango 1/2 cup sour cream zest of 1 lime juice of 1/2 a lime 2 tsp brown sugar 3/8 tsp cardamom Add all ingredients to food processor or blender and process until well blended. Refrigerate until ready to serve. I have to add that my husband and I just loved these. He's not hard to please, but I can tell when he doesn't like something...he's quiet and politely eats. When he loves something he's eating, he's very vocal and keeps telling me how much he loves it, which he did with these wings. And that sauce is perfect with these. It's cool and creamy, and wonderful for cutting the heat of the wings. I'd suggest giving each person they're own little bowl, because there's going to be lots of double dipping going on, hehe. Not only did he clean his wing bones, but he was sure to get every last drop of the mango lime sauce that he had. And he was looking to see if I had any left to give him. I was feeling nice and tossed him an extra wing, hehe.